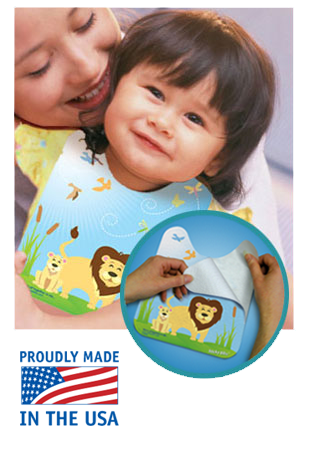 The one bib that quickly "Self Sticks" onto shirts!! Makes Traveling - Even BETTER! Now there's Sticky Bibs! Your hassles with bibs are gone... "for good!" Other bibs just can't compete. We've all seen the others fail... the edges, the sides, the bottom flaps - other bibs can't keep from flipping, twisting, and fumbling back and forth, -leaving you with a mess. Are you tired of the endless washings, your costs of detergents, and your frustrations with the stain removers - just to clean expensive cloth bibs? Are you tired of wasting your time? Well, if so... you've landed at the right place! You're not going to have to put up with any of that, anymore! When you see Sticky Bibs in action, you'll wonder how you ever survived without them!